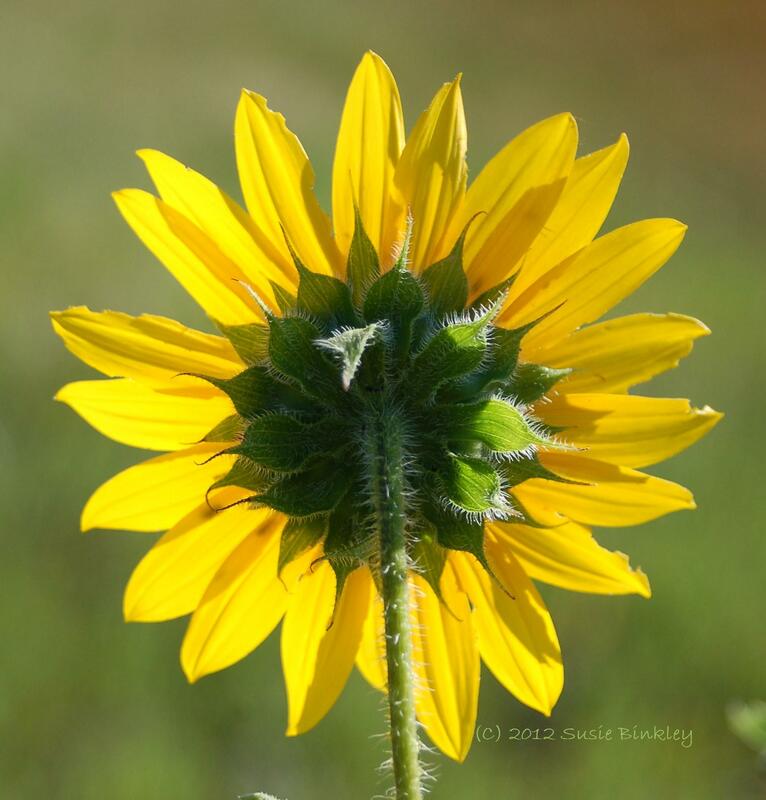 I was on quite a roll for a while, blogging consistently, doing my meditative nature photography and sharing it with whomever was willing to listen. Spring break came along and I took a week off from writing and photography to spend quality time with my kids. I’d just gotten back into the swing of things when life threw a new curve ball at me. I’ve been proverbially upside-down and hanging by my toes. Back in February, the first post I’d written based on my book was “Some days upside-down and barely hanging on by our toes, other days perched way up high and on top of the world”. 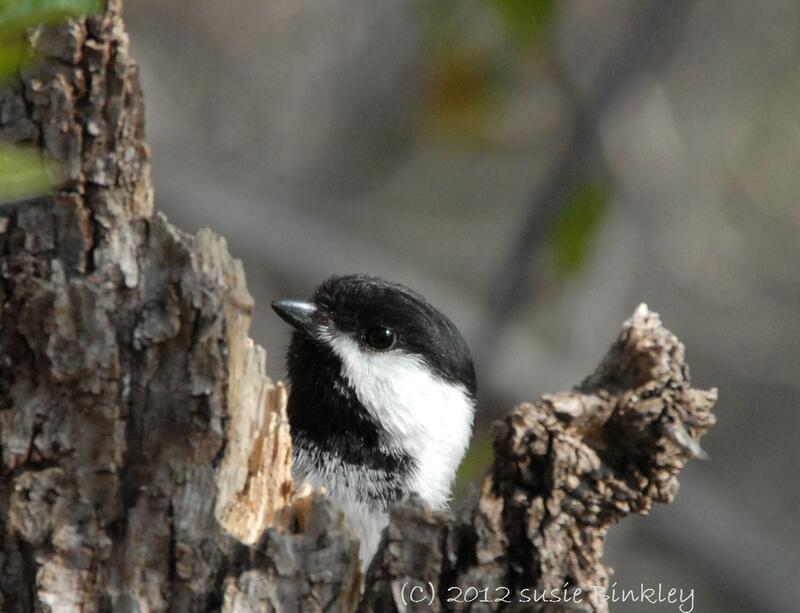 The pictures were of chickadees exemplifying those experiences rather nicely. 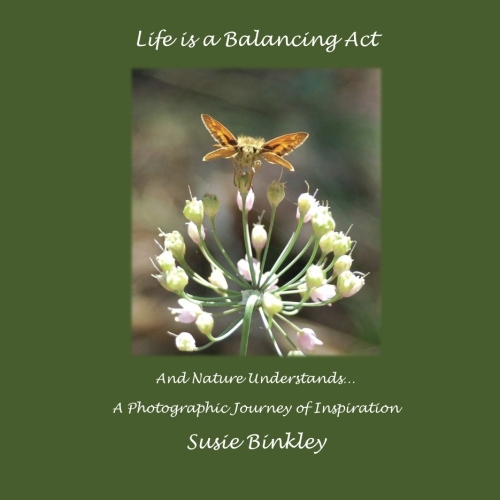 In that post I recounted how I’d both used meditative nature photography to face a medical issue, and how my daily nature photography finally had been ground to a halt by the illness. Well, after a nice little run of “on top of the world”, I’ve found myself hanging by my toes again. I’ve done very little photography lately- the pollen count of 11.5 was making that a miserable experience, and too much time braving the wafting particulate monsters apparently lowered my resistance, resulting in me becoming rather ill.
One of the hardest things for me to do since my kids have been born (and they’re now 12 and 15!) has been to allow myself time to rest. They’ve been fairly high maintenance little people (both with truly significant health needs of their own) and there’s never been much time to take any “me time” whatsoever. Moms don’t often get the luxury of “time off” when sick or exhausted. We just work through it. Motherhood doesn’t stop and wait for us. With my kids that was absolutely the case. And I in no way mean that in the whiny tone of a martyr. I adore my kids and being a mom! But I won’t deny that at times it’s been hard. So now that my kids are older and in better health, I’m having to completely re-learn how to take care of me. I’m re-learning how to slow down, listen to my body and soul, and just take time off. When this illness hit me, I was annoyed. How dare some little germs interfere with my time in nature, my photography, my sheer joy and “me time”? Hmf! Well, as reality would have it, germs really don’t care if you “hmf” at them. Sick is sick and recovery time is recovery time. No amount of running the trails or photographing gorgeous spring blossoms can make you well when you’re really not. I realize that my frustration with getting sick is because I had so little time off when my kids were younger. So now that I do have time for me, I relish it. I revel in it. On my daily nature hikes I’m like a kid in a candy store. Everything excites me; I can’t take it all in fast enough. I indulge myself in this self-pampering. I soak it all in with a zest for life and a passion for experience. I’m kind of unstoppable. After all, I have years to make up for! Years when the kids who needed me came first. There was no “nature hiking for fun” then. So now that my life has the space for that, the sacred me time for that, I don’t surrender it easily. I’ll push through the offensive pollen, cold weather, even falling snow to get my outdoor communion with the deer and flowers and chickadees. This is my time, dang it, and I cling to it unyieldingly. So this past ten days or so I’ve been fighting the need to rest. I started out pushing myself, then slowed down, then just collapsed in exhausted surrender. 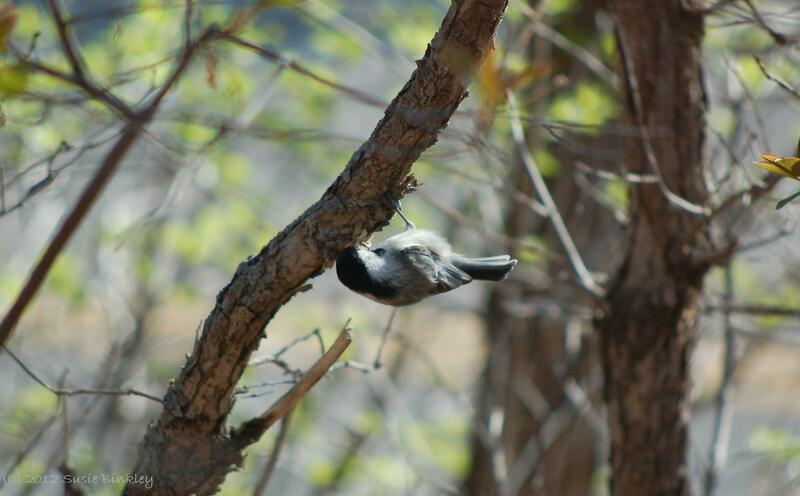 And then today I remembered the last group of pictures I took as I slowed down- it was these chickadees, just like from the February post. Oh, the juicy ironies of life. 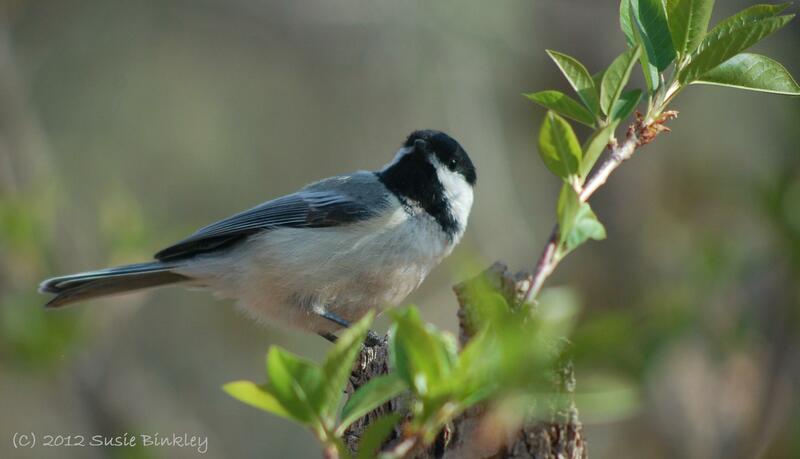 So here I blog about hanging by my toes again, poring through a folder of photographs of chickadees, giggling at the synchronicity, but interestingly, noticing that in most of the pictures the chickadees are simply being still. Sigh. Nature delivers yet another life lesson to me. 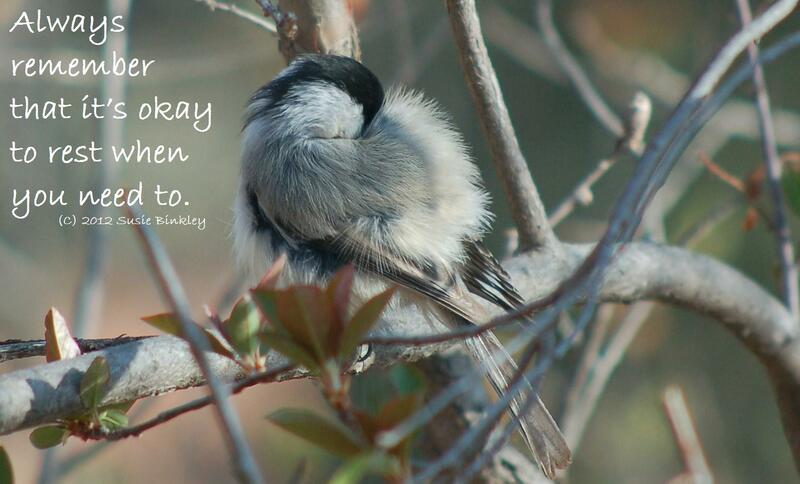 Time to stop and listen to her wise whispers. It’s just that, well, I’ve been resisting her message. One of the ironies I’m learning to navigate in my life is that the thing that is most healing to me- my time in nature, especially with a camera, can be thwarted all too easily by health issues. The irony is tough. What heals me, centers me, allows me the space to be healthy, well, sane, happy, and fit can also be the hardest for me to accomplish when I’m not feeling well. But if I just stop and listen to all of the lessons nature has taught me, all of the hints on how to live well, I see clearly that nature knows when it is time to rest. In the fall, the trees don’t make a fuss about resting for the winter. They just do it. When my chickadee friends, here, had done enough flitting about, they rested. And they didn’t look annoyed about it. So I need to stop being depressed about not running the trails lately. 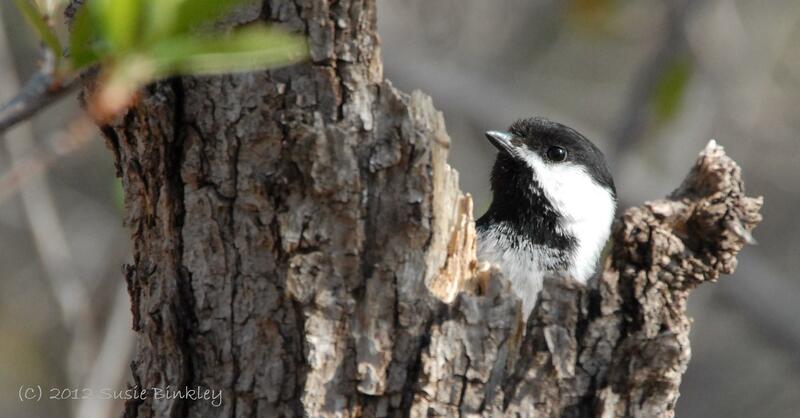 I need to stop being frustrated by my lack of chickadee time. I need to get over missing a few of the flowers blooming this year. But that’s the great thing about nature photography. I have pictures from all these years of meditating through the lens to pore through and look at. Nature is there for me, in photographic form, day or night, good weather or bad, sick or well. So today I’ll peruse my folders of photos and enjoy all the nature I’ve had the joy and privilege of experiencing over the years. I’ll let myself get lost in nature’s images; I’ll let nature’s lessons come to me. I’ll be grateful for the wonderful technology that is digital photography, the marvel that allows me to re-live memories in vivid and colorful detail. So I’m popping my head up to say hello to my blogosphere buddies. I’m not sure if I’ll be back full-time right away. This time I intend to rest as long as I actually need to! 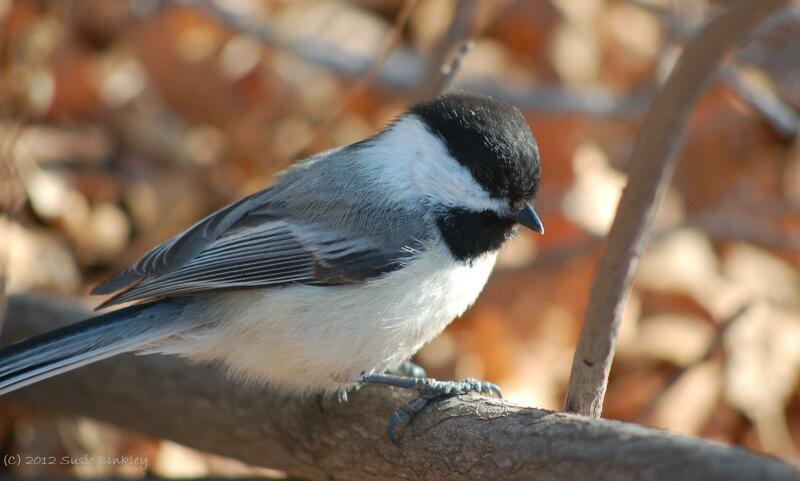 I hear the chickadees calling me to come play, but I’ll wait ’till mother nature lets me know that I’m truly up for it. So see you soon, my cute little nature friends, I’ll be back for your doses of wisdom soon enough.